Longbranch is a neighborhood bar and restaurant that's still plenty casual. 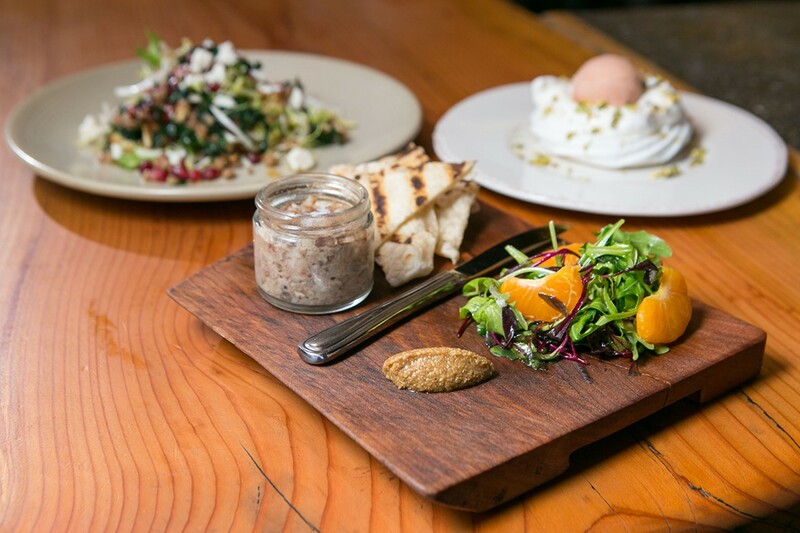 When you're in Berkeley, if you want to bring your kids out for an Alice Waters-approved dinner of organic vegetables and pasture-raised beef without having to change out of your flip-flops, you've got options. Casual and family-friendly is what the city does best. If, on the other hand, you're craving a steak at 10 p.m., well, then the pickings start to get awfully slim. That, perhaps more than anything, is what Longbranch Saloon, a new booze-focused restaurant in West Berkeley, has brought to the table. The chef, David Stevenson, who also runs the kitchen at Paisan next door, recalled that there were nights at his decidedly kid-friendly pizza restaurant when every drink order would be "cocktail, cocktail, milk, milk." Which was charming in its way. But over the years it became clear to Stevenson that the neighborhood needed more "adult space." Enter Longbranch Saloon, a neighborhood bar and restaurant that's still plenty casual (and accommodating enough if you come with kids in tow) — but that has 25 craft beers on tap, a ten-page whiskey list, and, perhaps rarest of all, a kitchen that'll serve you a full sit-down dinner until 11:30 p.m. six nights a week. Here, Stevenson's food falls squarely in the broad category of elevated, California-inflected pub food. 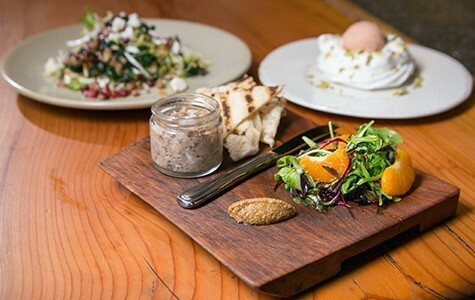 It's the same kind of menu you'll find at dozens of eating and drinking establishments in the East Bay — including the usual pickle-making and charcuterie, roasted bone marrow, and a fancy-ish $14 cheeseburger. This isn't the kind of restaurant at which originality is a big priority. Or, as Stevenson put it, "I guess we don't feel like we need to reinvent everything for it to be a good. We're not trying to be on that cutting edge." And a lot of the food is quite good — better than what you get at some gastropubs. Everyone and their cousin's bartender might be serving little glass jars of preserved, slow-cooked meats, but Longbranch's potted pig trotter was as porky and unctuous as you could want from such a preparation, and pairing the spreadable meat with grilled flatbread (instead of the usual crostini or toasted levain) was just enough of a twist to make it memorable. The Wisconsin-style fried cheese curds, while oddly chicken-nugget-like in appearance, were one of the better versions I've had: soft, stretchy, and satisfyingly creamy — especially tasty with a dab of Fresno chili jam, which brought to mind the sweet and spicy condiment that's sometimes served at Thai restaurants. Even a simple plate of room-temperature, grilled broccolini was notable, both for the smoky char of the leafy tips and for the addictive squiggle of tangy, garlicky aioli topped with salty cured-egg-yolk shavings. And there's something to be said for a bar that serves a well-made salad. Whoever is in charge of that part of the line at Longbranch excels at layering together thoughtful combinations of raw and cooked ingredients, with lots of interesting textures and bright, balanced dressings. A roasted cauliflower and lacinato kale salad hit all the right notes, with pomegranate seeds and toasted farro contributing crunch, and little nubs of ricotta salata providing a salty foil to the various sweet components. Here was a kale salad that managed not to be a cliché. Another winner featured shavings of peppery pepato cheese and both roasted and pickled beets. 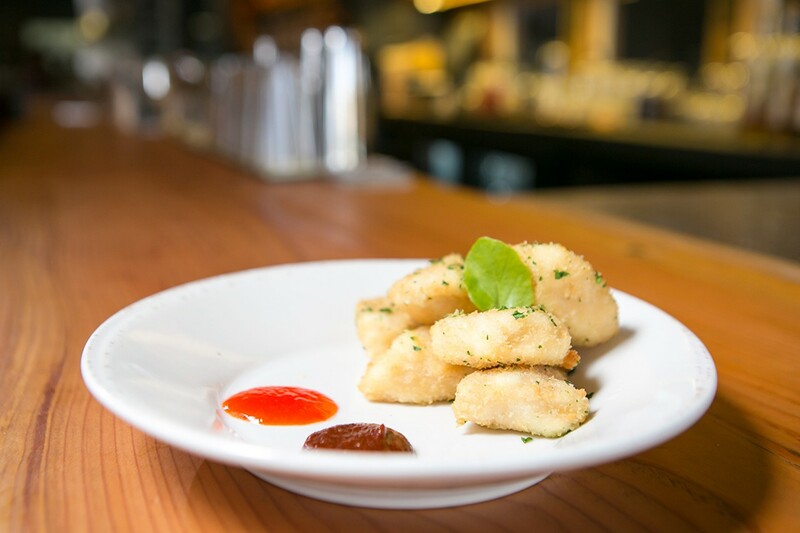 If the main courses at Longbranch Saloon were as good as the bar snacks and salads, it would be one of the better new restaurants in Berkeley, but alas, the entrées I tried all wound up boring me. Pan-seared arctic char was served atop a lovely sweet onion "jus," which could have been the base for a great soup, but the focal point — the fish itself — was bland and underseasoned. The star player relegated to benchwarmer status. Pasta with braised oxtails and beef cheeks was good in the way that oxtail cooked on the bone until tender is always good. But the tomato-based ragù-style sauce was one-note, and the sparse handful of flat, house-made rigatoni felt like an afterthought — as though the kitchen couldn't decide if this was supposed to be a meat dish or a noodle dish. As for that late-night steak I'd been craving, it turned out that a twenty-ounce bone-in ribeye was available on the limited menu that kicks in after 9:30 p.m. (and after 10 on weekends). It was as rich and fatty a cut as I could have hoped for, but, ultimately, the steak was a disappointment: not salted well enough to stand up to the knob of tangy Bearnaise butter on top, lacking a well-bronzed, crackly crust, and, in spite of all that fat, dry and overcooked to the point that there was barely any pink in the middle, despite my requested medium-rare. There's no need for "cutting edge," but simple food demands better execution. Desserts, on the other hand, were a high point. Both the surprisingly (but enjoyably) bitter chocolate pot de crème and the guava-sorbet-topped pavlova were crafted with grownups in mind — elegantly simple and not too sweet. In the end, this is a restaurant that just needs a bit of fine-tuning. Casual, familiar service matched the vaguely old-timey saloon-like atmosphere of the space, with its long communal table on one side and its log-cabin-like enclosed patio in back. In this regard, too, things could be tightened up — say, to make sure waiters don't bring multiple servings of bread to the table without mentioning that there's a charge, or that the late-night shift feels a little less harried. Berkeley old-timers will recall the restaurant's namesake, a divey rock club, located a couple of doors down, that hosted rock stars like Eddie Money and Patti Smith in the Seventies. And even relative newcomers to the city probably remember Sea Salt, the seafood restaurant that was a neighborhood fixture in the space until it went dark in early 2013. It's nice to see the place open again. And not only open, but bustling, at least during my visits — especially late on a Thursday night, when the restaurant's late-night happy hour drink specials were in effect, and the bar area was fairly packed, and you could order $5 glasses of Sangiovese to wash down a burger or some mussels or steak. For the night owls among us, that in itself feels like a miracle.